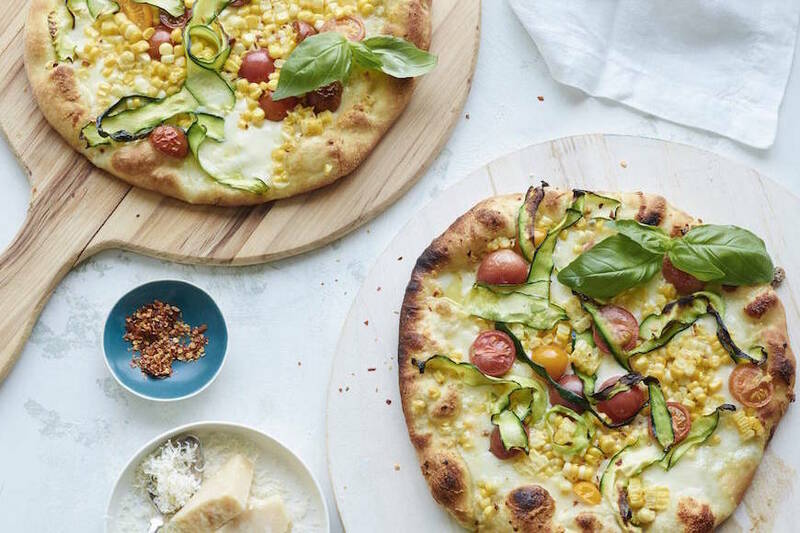 The tail end of summer has some of the best produce, so why not celebrate all that’s at the market right now with a little Corn and Zucchini Pizza!! I feel like I’ve put raw corn in just about every single recipe this summer. Is there such a thing as too much corn? I think not. Last summer I was all about the zucchini noodles and this summer it’s been raw corn here, there and everywhere. So why not throw the 2 of them together on a pizza loaded with fresh mozzarella and an infused olive oil and call it a day. 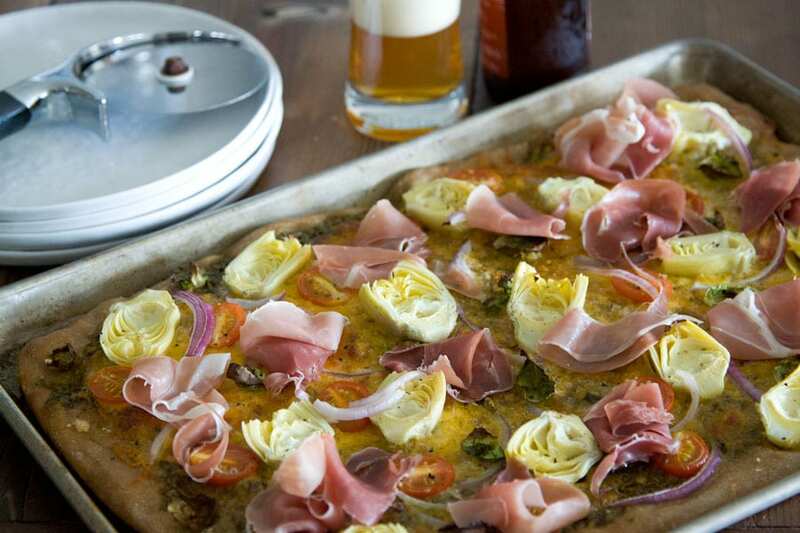 It’s the perfect pizza to celebrate all the bounty that’s here for a few more week! Pre-heat your oven to 500 degrees. Thirty minutes before cooking the pizza, put your pizza stone in the oven. Divide the pizza dough into 2 even pieces. Stretch each piece of dough in a circular motion, then lay them both out on a flat surface and flatten out using a rolling pin. If you have a pizza peel, sprinkle some flour on it and place the stretched out dough on the peel. 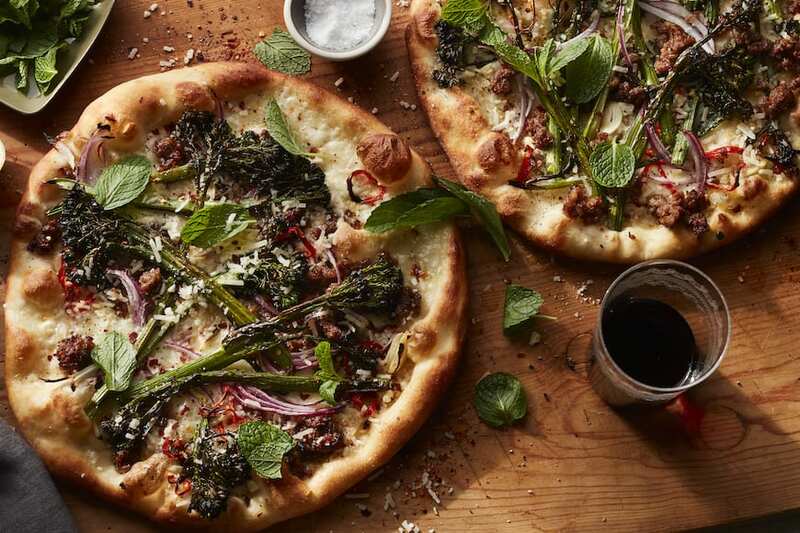 Once your 2 pizza doughs are flat and ready to be cooked, use a spoon to spread the garlic and parmesan infused olive oil all around the dough leaving a little bit for the crust. 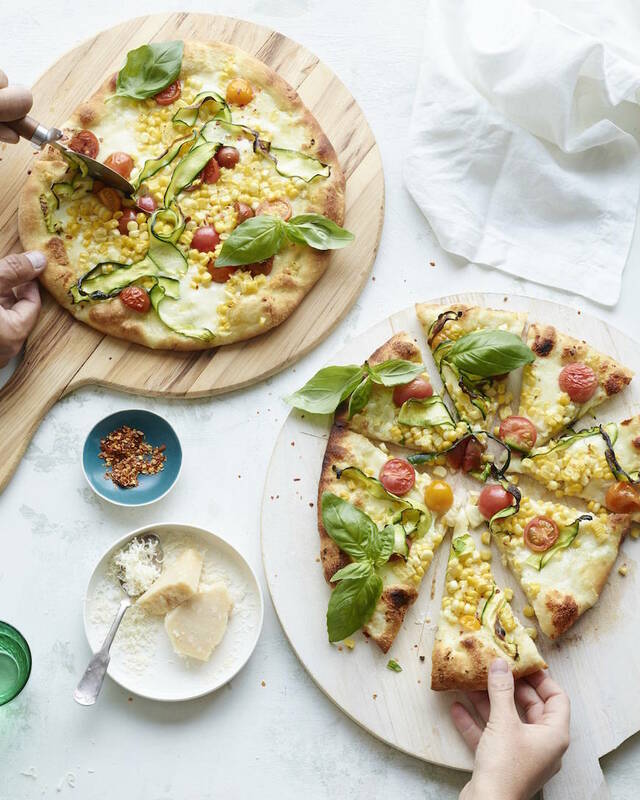 Tear the mozzarella balls into pieces and top each pizza with equal amounts of the mozzarella, corn kernels, halved cherry tomatoes and thinly sliced zucchini. Transfer the pizzas into the oven and bake for 12-13 minutes until the crust is perfect. 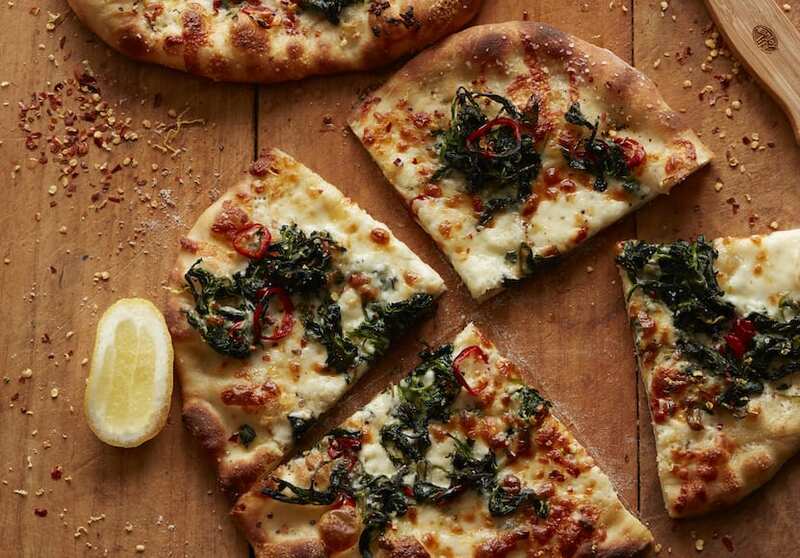 Remove pizza from the oven and top with fresh basil. Season with salt and pepper and additional red pepper flakes if needed slice and serve. Combine all the ingredients in a small bowl and stir to combine. Set aside for later use. Pizza perfection, I love this! 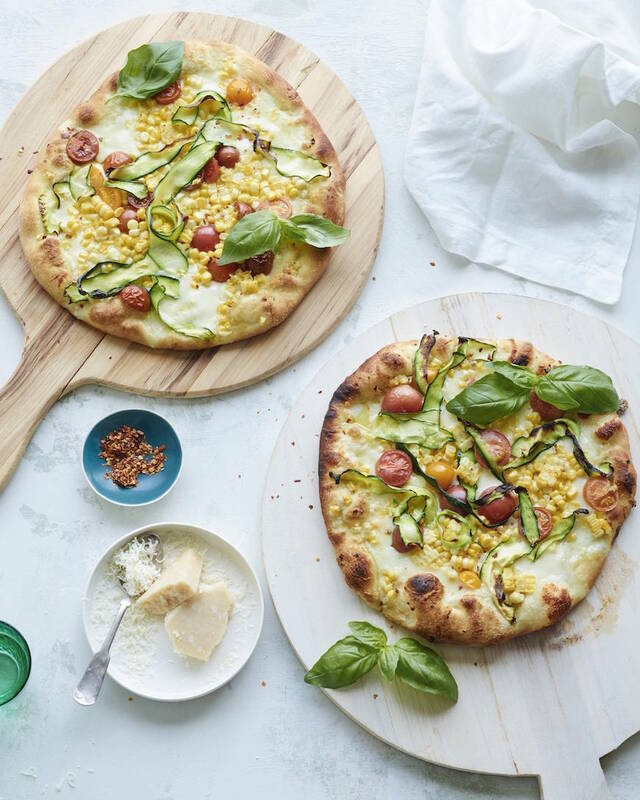 So cute and colorful, I hadn’t thought of corn on pizza before! These are my favorite summer garden veggies all put together on a perfect pizza!! Now I just have to whip up one of your salads and I am good for tonight! !